Making a custom classifier is especially easy if you have an existing data set that you can use. 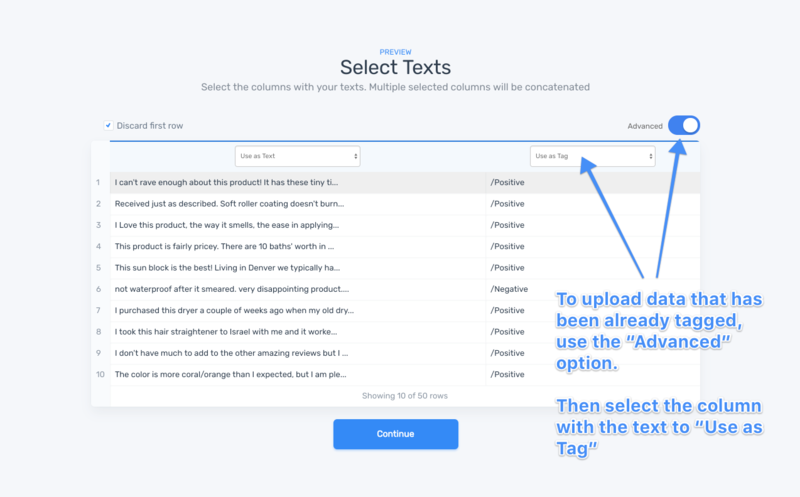 With MonkeyLearn, you can upload your already tagged text data as part of of the model building process. To upload existing data, make a new classifier and select the option to upload a CSV or Excel file. In the next step where you "Select Text", turn on the Advanced settings, and then select the column or columns that will be used as text, and the column that contains the tags. You can learn more about CSV / Excel format here. If you have multiple tags per text, you can join the tags together separated by a colon (a ":"). For example, if a piece of text has three tags Tag A , Tag B , and Tag C , then you would combine these three tags in the same column together, i.e. TagA:TagB:TagC. This way the model will be trained with the three tags in mind.